Alt Gobo shot not one, but two 30-second public service announcement spots for the Women in Film and Video’s Image Makers program. The clients this year were the DC Library Foundation and The First Tee program. The Image Makers Program is WIFV’s community outreach initiative for metro area high school students. 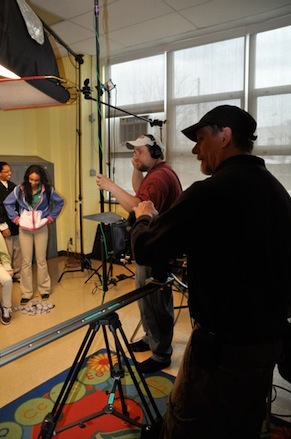 It was created in 1997 to teach local youth about film and video production, while also helping deserving nonprofit organizations. Image Makers participants learn how to research, write, produce, direct and edit PSAs for broadcast distribution. These PSAs are made for up to three deserving nonprofit organizations each year. The creative program is taught over the course of eight Saturdays and concludes with a show where each of the finished PSAs are presented to the non-profits. In one session Peter Roof and Kathi Overton gave the students a “Five Minute University” class in lighting, camera, and sound. The District of Columbia Public Library Foundation leverages and enhances DC Public Library resources and programs that promote, in all community members, literacy and a thirst for knowledge. The First Tee provides young people of all backgrounds an opportunity to develop life-enhancing values such as confidence, perseverance and judgment through golf and character education. For both productions Alt Gobo provided the Panasonic HPX170 DVCproHD camera and lights with Peter Roof on camera. Additional tools employed were the matte box and Glissade® camera slider. For the Library Foundation (pictured above) shoot Kathi Overton provided sound and assisted on lighting and focus pulling. The location was in the newly renovated Petworth Library in NW DC. The purpose of the production was to show the variety of activities found in the library besides reading books. Watch the completed PSA here. On the FirstTee production Toby Roberts (pictured right) did the sound and helped with lighting. The location was inside a school for a locker room setting and on the Langston Golf Course in NE Washington. Toby is an avid golfer so he enjoyed the subject and was able to put in a round of golf after we wrapped. Watch the completed PSA here.